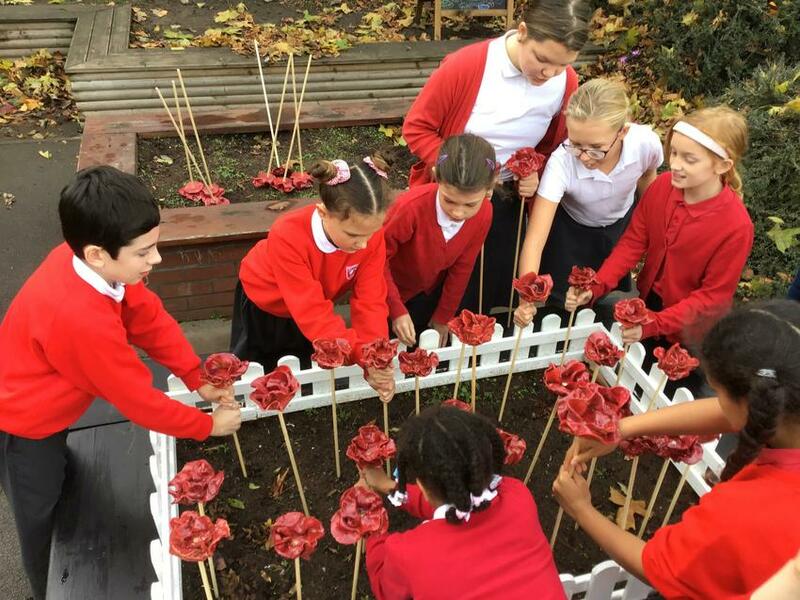 On Friday the 9th November, two days before Armistice Day, at Oldswinford Church Of England Primary School the annual remembrance assembly took place. This year the anniversary was extra special because it was the centenary, so of course the annual service had to be even better than usual. At ten past nine the whole school gathered in the upper school hall, including some governors and all the staff. Mrs Seker, the acting Head, led the service which had been rehearsed the day before. The service started with Mrs Seker saying a short introduction explaining why the school had gathered. 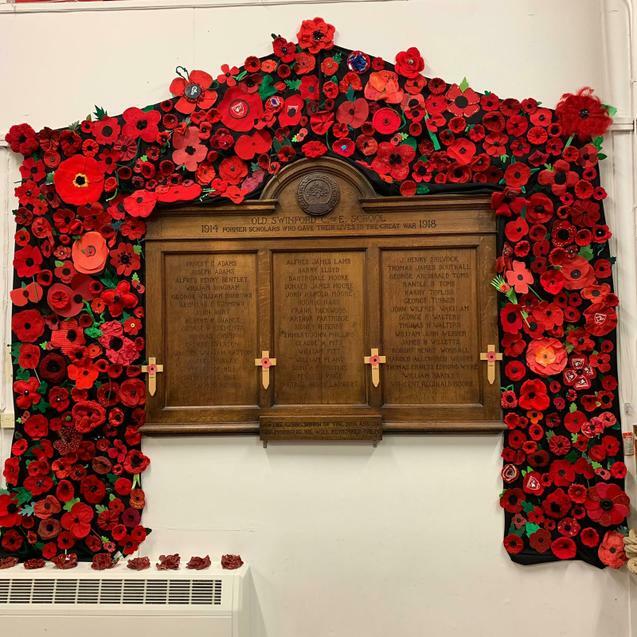 The acting head also said thank you to those who had made poppies at home upon request to put around the wooden display that had carved into it the names of the soldiers who were Oldswinford students who had fought in the war; she exclaimed that it now looked amazing. She also said two white poppies made by a family in the school would be placed beside a new plaque below the display that would represent peace that was to be put up in the near future. Year 2 then read an excellent acrostic poem all about remembrance. The school was then shown some fantastic poppy wreaths made by year one and some brilliant poppy pictures painted by Reception, who also explained that they had painted the pictures with recycled bottle tops! Mrs Seker then explained what would happen in the two minute silence. The Last Post signalled for the school to stand up and after it ended the school had the annual two minute silence in which they could reflect on how all the soldiers in World War One gave their lives to make everybody`s experiences better for today and tomorrow. This was then followed by Tom from Year 5 playing the national anthem expertly on the euphonium and Annabel from Year 3 playing Imagine by John Lennon on the keyboard, during which the school stayed standing. The children and staff then sang the same song that Annabel had just played, this was accompanied by Mr Hicklin on the guitar and the very talented Mrs Smith on the piano. This respectful song was perfectly fitting for the service. Seated again, the gathering then watched a short video of footage of some of the animals which were involved in World War One. This was enjoyed especially by KS1 who were heard saying ``That`s so cute! !” This set the scene for KS2`s part in the assembly which was to be very interesting. This started with a few students from Year 4 telling the school some informative information about the role of pigeons in World War One and Year 5 showing them some awesome poppy pictures. Year 5 explained that they had handmade the poppies and placed them carefully to show silhouettes of a soldier and a cross! Year 6 students then did a piece about glow worms; this included a student reading out a letter written by a civilian to her fiancé, a soldier during the war that was supposedly read in the darkness by the soldier using the glow worms. Year three then sang a song called 'A wish for peace' very well; this was also accompanied by Mrs Smith. Next the visionaries, a group of students who are spreading the school vision throughout the school and community, spoke on their newly planted poppy remembrance garden. This was followed by two siblings from the school showing some artefacts that were owned by their Great Grandad, a stretcher carrier in the war. The service was ended by a special prayer and a short conclusion by Mrs Seker. Overall the assembly touched the whole school and kept those heroes from the war alive in their hearts. As everyone’s lives carry on, this momentous service will always be remembered as a tribute to those who died for world peace.